Hey folks -- Today is Internet Freedom Day and that's a really big deal. A year ago, many good people on the Internet came together to stop SOPA. Internet Freedom Day reminds us that we all need to work together to preserve what we have and to help everyone realize their own individual voice. It's something which we assert frequently, not just one day, but it's one way to remind ourselves that what we take for granted can be lost. This year, I asked folks: How does the Internet give you a voice? I got a lot of really good responses, and wanted to share some of them with you on Internet Freedom Day. danah boyd: Senior Researcher at Microsoft Research: In a broadcast environment, the young punk troublemaking activist version of me would never have been given a microphone. In a world of credentialing and hierarchies, I was nobody. But in 1997, I started blogging. I started documenting what I saw and providing my interpretation of key socio-technical issues. I was able to draw people in and build an audience based on my insights, not my status. This became the foundation of my career. As a teenager, the Internet allowed me to realize I wasn't alone. As an adult, the Internet allowed me to use my voice to share knowledge and inform others. I wouldn't be who I am if it weren't for the Internet. Gary Vaynerchuk, Author, Wine, and Social Media Expert, ‏@garyvee: Allowed a jersey wine retailer like me the chance to speak to the wine world by never leaving my office and not rely on media. Elisa Camahort Page, ‏Co-Founder of BlogHer, @ElisaC: When I started using it myself it changed ALL. Made me a writer, an activist & finally an entrepreneur. Tara Hunt, Author and Entrepreneur: Every time I was lost, the Internet found me. Or rather, the people on the Internet did, but without the platform, it wouldn't have been possible. Because of the Internet, I found a voice, I built a career, I wrote a book, I became a public speaker, I traveled all over the world, I met (and meet) thousands of interesting people I wouldn't have otherwise, I started movements, I joined movements, I met my co-founders, I met the love of my life, I adopted my dog, I keep in touch with my son, I learn and grow every single day... I don't know if I could even imagine a world without the web. My IRL world and my virtual world are interlinked so deeply that there are no clear boundaries. Danielle Brigida, Senior Manager of Social Strategy at NWF: The Internet gives me a voice, but it also gives me new ears to listen. I feel like I learn so much every day from the people I associate with online. I also know that while it provides unique ways to express myself, it can extend the life of my experiences elsewhere -- offline. Jill M. Foster, Founder of Live Your Talk: The Internet breaks the world of self-assertion wide open. It has become many things, centrally a testing ground for my perspective and creativity. Could an idea work on online video? or better through a photo essay? Or is it better written, brief and social? It lets answers to these questions be tested more than what I ever imagined; that's powerful for testing voice and point of view. And strangely, the Internet has revealed when silence is golden too, leaving the voice to turn inward or offline. Sheila Katz, Associate Director of Ask Big Questions: Without a doubt in my mind, I know that the Internet has maximized my voice... [Today] I posted an article on gender equality and shared information on organizations I feel passionate about. I use social media to fund-raise for excellent causes, share my voice in national conversations around important issues, and to get more students asking Big Questions. I use the Internet to create community and spark action. @Britrock: For squirrels it obviously gives them a voice where in the past they only had squeaks. @jamie_love: Allows us to create a user generated new media, in an era where journalism is under-funded and reporting scarce. Margaret Carney Myers: I get to read about people doing things I have only dreamed of -- like protesting the Keystone pipeline on stolen Native American land. @connectaschool: If we want to nurture a critical mass of young people who trust and respect each other, we need an Internet that fosters freedom of expression. If we want to empower future leaders to work together towards a healthier and safer planet, we need an Internet that supports an open and fair exchange of ideas. 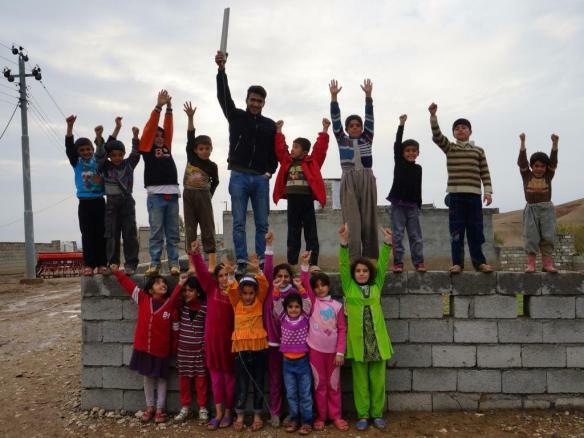 Team Antenna in Lajan Village, Kurdistan, Iraq, cheer a green light on their modem! The group is participating in Touchable Earth, the first digital world book for kids where kids in each place explain all the facts about it. The Christopher Stevens Youth Network will support efforts like this in 20 countries. @chr15_eat0n: The Internet allows me to connect with freedom fighters around the world & act in solidarity with them. @yearofkindness1: I started a youth empowerment and anti-bullying movement in my school focusing on bravery and awareness. The Internet allows me to reach people all over the country at the same time, and it works! Debby Guardino: I'm just a teacher. I'm not anybody special. But by spending a few weeks on a computer in my living room, I was able to generate $400,000 in donations. I'm just blown away by the power of social media. It's made me more confident. I feel like I can do anything when I set my mind to it. Bessie & Claude DiDomenica: For many people, freedom and liberty seem to be ethereal nebulous concepts. However, people without freedom appreciate what we all often take for granted. Our thanks to craigconnects for the opportunity to remember ideas that are most precious to all of us: Freedom and liberty. We all need to work together to protect our liberties... Far too often, there are forces that don't understand the shortsightedness of censorship. Angela Young: I think that everyone has something to say. Traditionally, finding the right platform to say it was challenging. Now that we have the Internet, it provides the ability for each and every person to create their on platform to share what they need to, or are inspired to share with others. I really want to help give a real voice to the voiceless where I can, and it's nice to start with the Internet -- a place that gives me a voice, too. We need to protect what we have in the U.S., and that includes really protecting our freedom on the Internet. Let's all make a point to remember #InternetFreedom Day throughout the year, folks, it really connects us and helps to give the powerless real power.